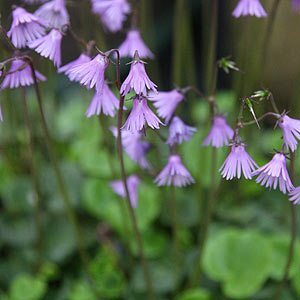 With dainty flowers on tall stems, Soldanella are a wonderful little woodland plant that grow happily in light shade in a humus rich soil. Sometimes called the Snowbell, these are excellent plants to grow amongst any low growing woodland plants. They work well with Galanthus (Snowdrops) and Acis (Snowflakes). Species such as Soldanella Alpina, the hard to find white flowering S. montana and S. villosa are all alpine plants, low growing clump forming with pretty nodding heads. The foliage is close to the ground, rounded and attractive in itself, but as the flowers rise above in spring, like little hats on sticks the wonderful nature of these alpine plants is truly appreciated. Flowers are either a mauve or white depending on species. Soldanella plants are also know as the english snowbell, you start to get an idea of the conditions required. Moisture retentive soil (not boggy). Protect from snails and slugs in spring as flowers form. Also suited to growing in containers in a cool position.